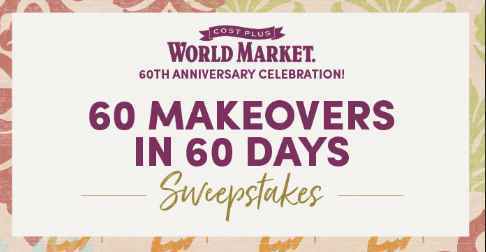 Enter the Cost Plus World Market 60 Makeovers in 60 Days Sweepstakes for your chance to win a tiny House with an approximate retail value (“ARV”) $55,000; a selection of Cost Plus World Market furnishings with an ARV of $5,000; and a $1,000 Cost Plus World Market gift card. How To Enter: During the sweepstakes period go to this link:worldmarketsweepstakes.com and follow the online instructions to register by entering all information requested on the registration form and once you filled out the entry form now Click on the submit button to complete the registration form. Prizes: One grand prize winner will win a Tiny House with an approximate retail value (“ARV”) $55,000; a selection of Cost Plus World Market furnishings with an ARV of $5,000; and a $1,000 Cost Plus World Market gift card. Total ARV of Grand Prize: $61,000.00. When To Enter: The Sweepstakes entry begins at 12:01 a.m. Eastern Time (“ET”) on 08/02/18 and ends at 11:59 p.m. ET on 09/30/18. Who’s Sponsor: The Cost Plus World Market 60 Makeovers in 60 Days Sweepstakes is sponsored by Cost Plus World Market, 1201 Marina Village Parkway, Alameda, CA 94501.